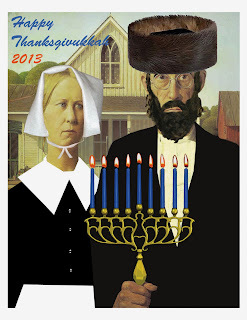 Perry Block - Nouveau Old, Formerly Cute: Here Comes Thanksukkah/Hanusgiving! As most of you now know, this year through some bizarre confluence of the Hebrew Calendar with the Western Gregorian Calendar, many people are looking up the word "confluence." Additionally for the first time since 1888, the usually close-to-a-month apart holidays of Hanukkah and Thanksgiving will strikingly coincide. This unique situation presents a singular opportunity for two traditional underdog holidays both regularly overshadowed by Christmas to team up and take on the champ. Think of it as Rocky times two vs. Apollo Creed. And together as one, Thanksukkah/Hanusgiving* have more than enough seasonal goods to give Christmas a run for its over commercialized money. There's 12 collective days of holiday if we count Thanksgiving as four, great food, presents for the kids, interesting backstories, spinning dreidels, shoes with adorable buckles, Hannukah Gelt, lots of pie, and a common and well resonating message of religious freedom and tolerance. The only drawbacks are the six or more days of leftover turkey forced feedings associated with Thanksgiving and Hannukah Gelt itself, which tastes only marginally better than the gold wrapping in which it comes. 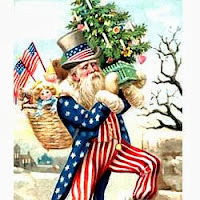 1) Christmas and the Fourth of July. Of course many of you aren't old enough to remember when Christmas and the Fourth of July fell together on the same date for the first time in 56 years in 1974. It was a banner year for the City of Philadelphia as pilgrims worldwide converged on the Quaker City and led light stick processions to Independence Hall, many of them wearing small replicas of the Liberty Bell around their necks. The Pope that year held a special Christmas Eve Mass in which he mentioned all four Philadelphia sports teams by name. It seemed in 1974 that there were carolers on every street corner favoring seasonal fireworks shoppers with old favorites like "Rudolph, the Red, White, and Blue Nosed Reindeer," and '74 was the year that Santa Claus and Uncle Sam --- long suspected to be one and the same --- were finally outed when Uncle Sam forgot to tightly fasten his 490 pound fat suit before diving down the chimney of one Ralph Merkle of Jersey City NJ, as captured in the now mega-familiar photo at right. 2) Mardi Gras and Labor Day. When these two holidays fell as one in 1952, Labor Day with its ever depressing augury of the end of summer knocked Mardi Gras for a loop from which it almost never recovered. Jazz bands remained unbooked, drunk and disorderly arrests were down sharply nationwide, and many people reluctantly went out to buy notebooks for the new school year. In New Orleans, the bars were closed. 3) Memorial Day and New Year's Day. These two holidays have already coincided three times in this century alone but it being that both holidays fell the day after New Year's Eve, no one ever noticed. 4) Groundhog's Day and Valentine's Day. The unusual confluence of these two holidays in February 1911 proved a bitter pill for their two putative iconic symbols, Puxatawney Phil and Cupid, rumored to hate each other almost as much as Adam Sandler hates being funny. Tirelessly working the small town of Puxatawney for 24 hours in 11 degree weather in an effort to show up his laconic rival, Cupid had to be treated for severe hypothermia and partial loss of a wing after producing only a handful of engagements and one lukewarm seduction while Phil for his part saw his shadow and promptly received over 7,000 proposals of marriage. 5) Simchat Torah and Shavuos. Simchat Torah normally takes place in the early fall and Shavuos takes place in late spring. Unfortunately no Jewish person other than the most extreme among the Orthodox knows enough about them to write a halfway decent joke here. 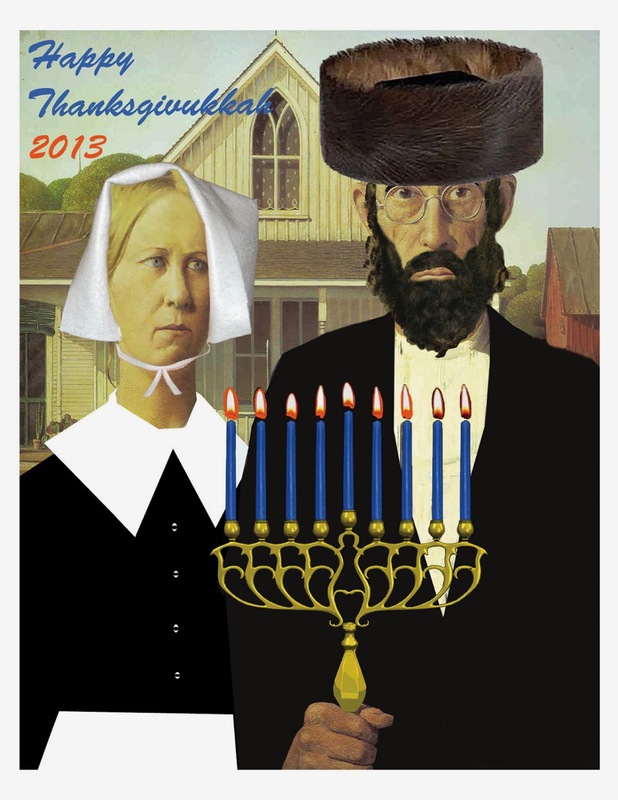 So will Thanksukkah/Hanusgiving come out swinging this year and finally deck the holiday that "decks the halls?" I dunno. We'll have to see what Santa has up his sleeve. Or Uncle Sam in his fat suit. This piece also appeared in the Broad Street Review on November 6, 2013. They went with my original title even though they knew better. I only have brief memories of 1974 as I spent most of the year in a drug and alcohol induced stupor. Like Mardi Gras, I've never really recovered. Here in Arkansas, if a ground hog comes out of his den in February his shadow will be the last thing sees before becoming the main course on Valentine's Day dinner. The person who gets the "pulley bone" gets to marry his cousin's sister instead of his own. Rumor has it this was the real reason behind the whole Hatfield and McCoy feud. So much good information, but a shame you didn't get to Philadelphia for Christmas/Fourth of July in 1974. There were so many hot women dressed in shorts and tank tops who wanted to huddle close to someone at the fireworks display because it was 8 degrees out and they were much in the Christmas spirit as well. Very nice entwining. Not sure what a pulley bone is, but I don't have a sister so guess I'll have to marry my cousin's sister which won't please her husband or her.